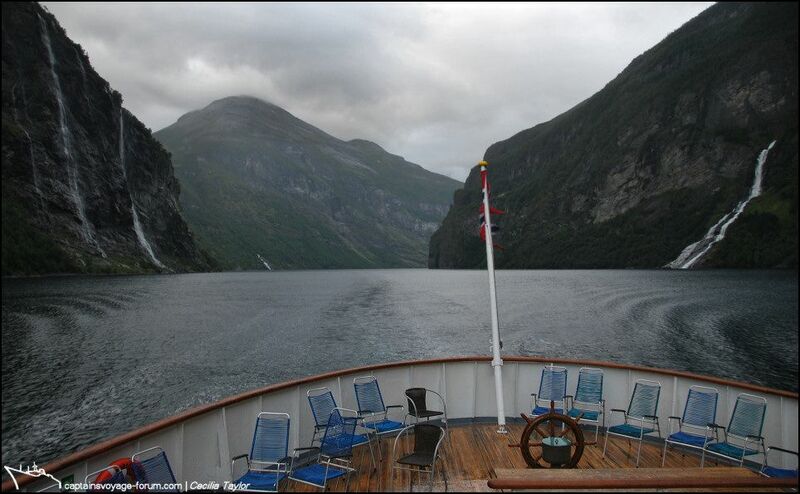 By the time dinner was being served, the rough conditions had abated and the low clouds lifted as the ship passed the Seven Sisters waterfall. It’s wet but calm as the dusk falls and the postflag is lowered at nine o’clock. 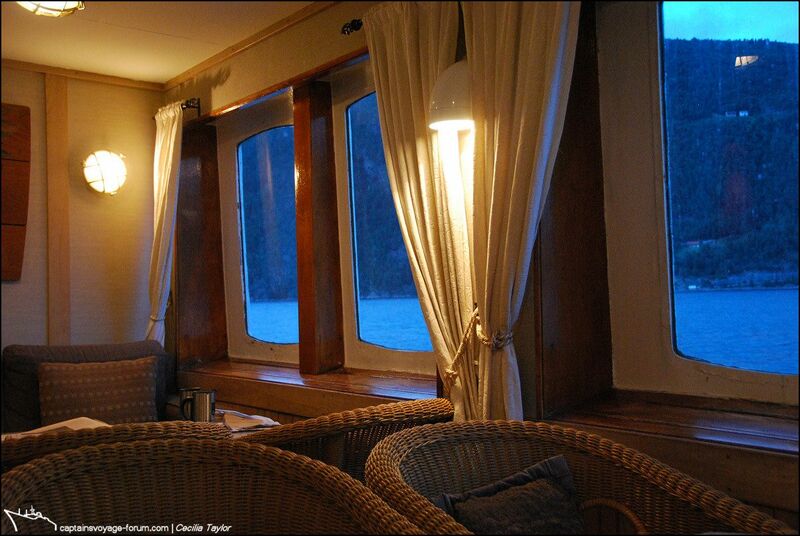 I end the day with warm memories of the cosyness of the dear ship in the blueness of approaching night. Wow! Such a marvellous continuation of your report. 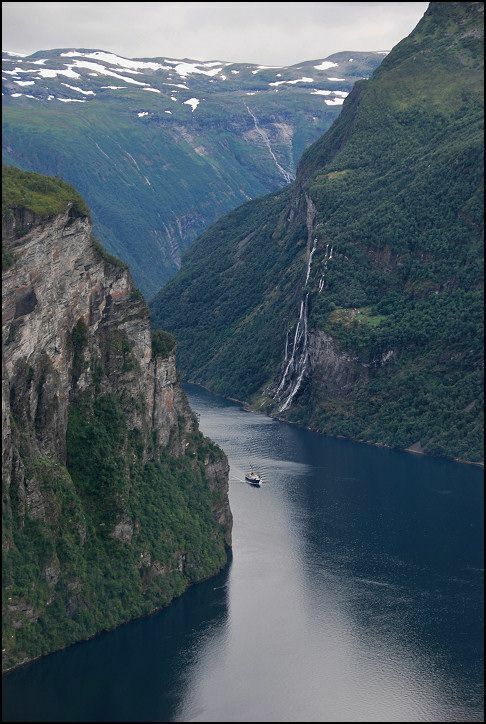 Such a lot of absolutely top pictures of Nordstjernen in Geirangerfjord!! You could fill books and broshures with it. 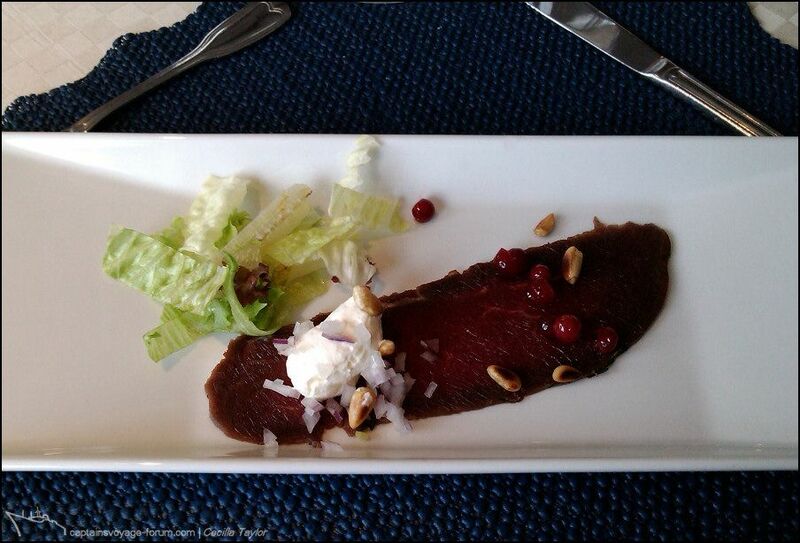 Such a diamond Hurtigruten is going to give away! Tourists or adventurers? Coach or convertible? Remote controled or self drive? Schettino or life raft? No question what i would choose! You could not have better reported these feelings! Sarnia and Carina, thank you so much. I will never know how I managed to hold my camera steady, let alone compose a picture, in that unforgettable and emotional moment when I realised what I was seeing as the ship appeared! Thank you so much Ralf. You made me think about the day when the booklet describing the Norwegian coast excursions popped through the letter box. It was produced uniquely for this one cruise, and was much in the style of what was sent for the only non-Hurtigruten cruise I have ever been on, that aboard Discovery –and you will certainly remember sharing that pre-trip planning with me! (and VERY excellent your research and advices were too in making choices!). I suppose it is the standard kind of thing for optional separately charged excursions on cruises generally, and I am sure that the skill of the cruise line in blending these “out-sourced” arrangements seamlessly with the in-house style aboard ship depends on building appropriate and like-minded relationships with excursion providers. Of course costing is important –there has to be the small print about minimum numbers for an excursion to run, and I clearly recollect thinking the kayaking might not make it! How wrong I was! 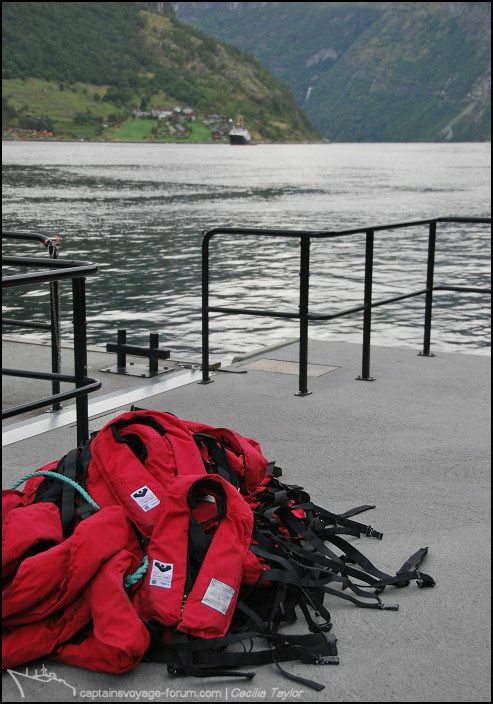 Following your mention of such more adventurous activities I found this website which might be the organisation involved here (the excursion booklet mentioned the kayak base as being at Geiranger Camping). And here are the people who hosted the King Crab excursion from Honningsvåg. I’ve already sung the praises of the bus tour guides from Ålesund, the museum guide in Alstahaug, and the teamwork and enthusiasm of the arrangements in the communities of Vega and Ørland. 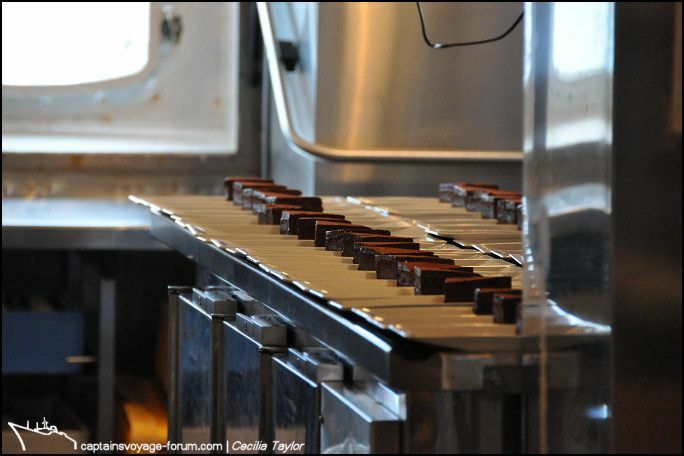 I know that not everyone is wanting to take excursions on the regular coastal voyage, but many who come for the first time or who are used to other cruise lines do, and it is important to get it right. 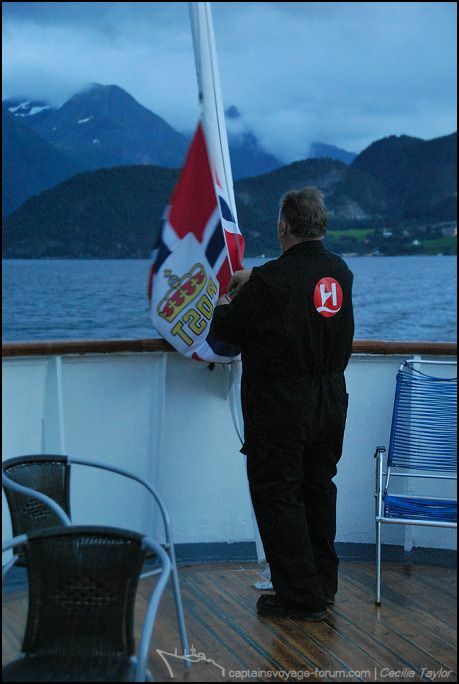 I remember how back in 2005, my first Antarctic Explorer cruise on Nordnorge, that the local city tour arrangements in Buenos Aeries were chaotic and as a return passenger how embarrassed I felt that for some this was their first impression of what they perceived to be Hurtigruten. I kept saying to the disgruntled people “It’ll be fine once we get aboard the ship”, and of course it was! More positive excursion experiences to follow when I reach the last day of the voyage! wow,what a trip you made Cecelia. what a vieuws there and that road.must be awesome to drive there with a overpowerd 4wd. Something that in a way describes the difference between cruising on a huge ship and a expedition vessel. I would choose the latter. #1612:1, oh my, what a caption of that feeling being on board! Thank you Tommi, and janihudi, I can’t quite imagine Highway Cruiser doing Trollstigen! 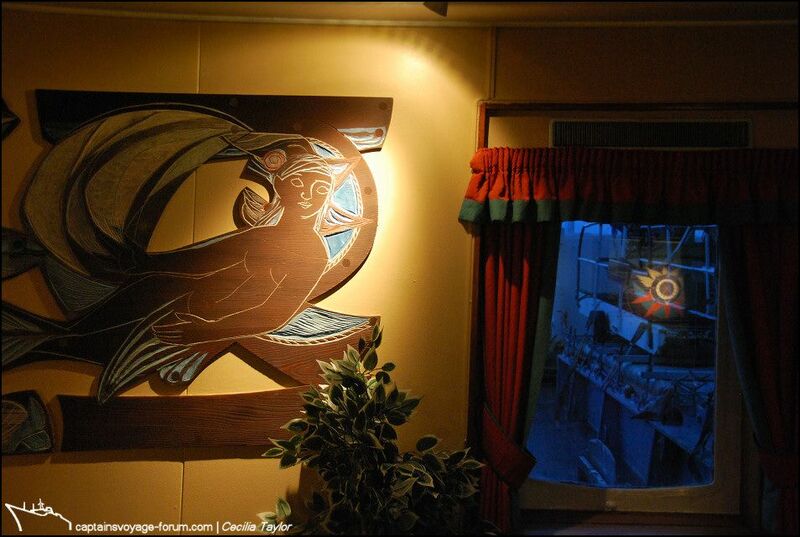 There have been several views of Nordstjernen’s dining room and even glimpses of the breakfast or lunch buffet that have crept into this narrative, but the evening meal deserves rather more attention before I finally move onto the last day of the voyage. 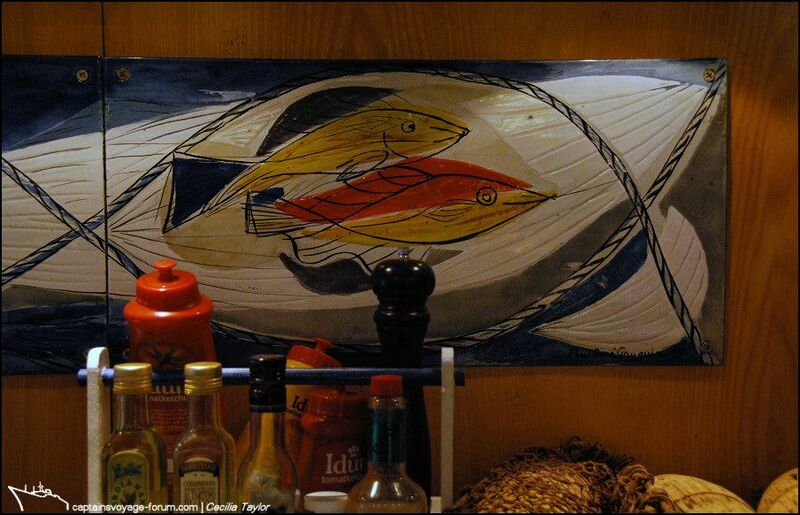 Dinner was a served three-course meal, and it was excellent, the kitchen staff deserving of the highest praise. I think the only complaint I heard anyone utter the whole fortnight was that the main course portion of tuna was too large and it was a pity to have not been able to eat it all …but might that have been the day when many of us had consumed second and third helpings of King Crab during the afternoon excursion? –I can’t really remember! I particularly looked forward to the starter each day. 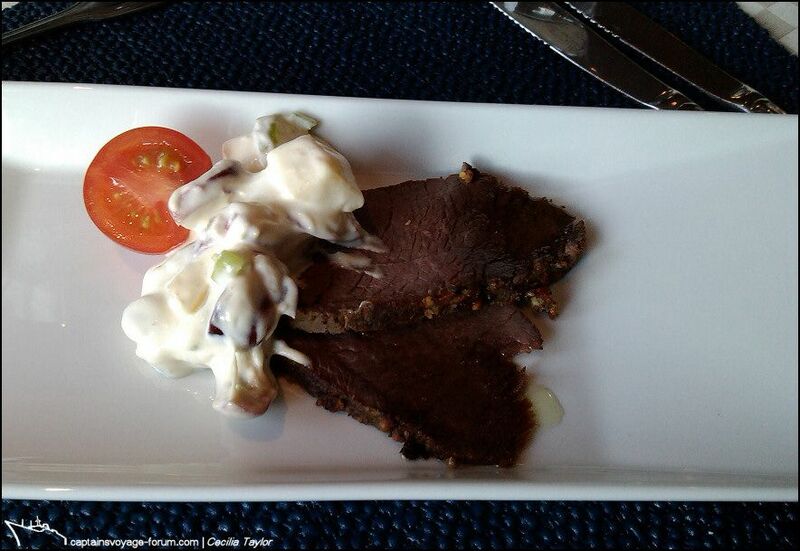 Sometimes it was soup, and soup in Norway in general and aboard a hurtigrute in particular is always a pleasure. It seems I always tucked into it immediately as I don’t seem to have taken a single photograph! Other starters were more frequently photographed. They were my favourites, as pretty on the plate as they were to taste, and easily the match of many a supposedly classier ship or restaurant. 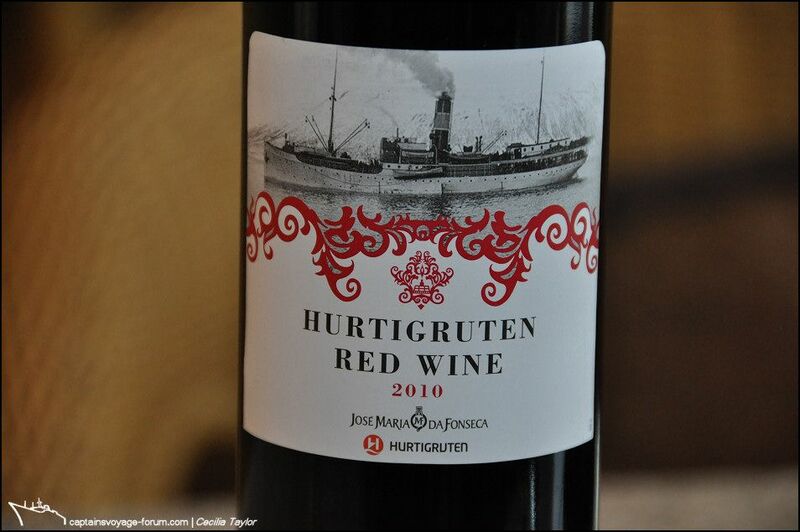 It’s nice that the house wine, or as I should more properly say the ship’s wine, not only has its special label, but the particular blends are made specially for Hurtigruten. 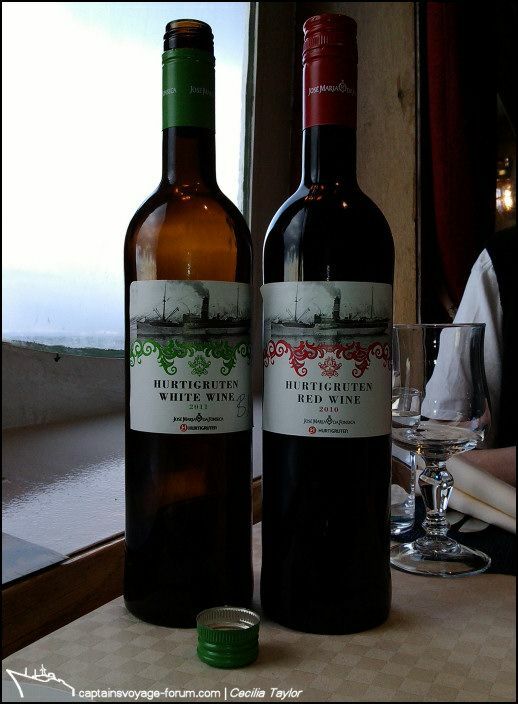 The winery is that of José Maria da Fonseca in Portugal. 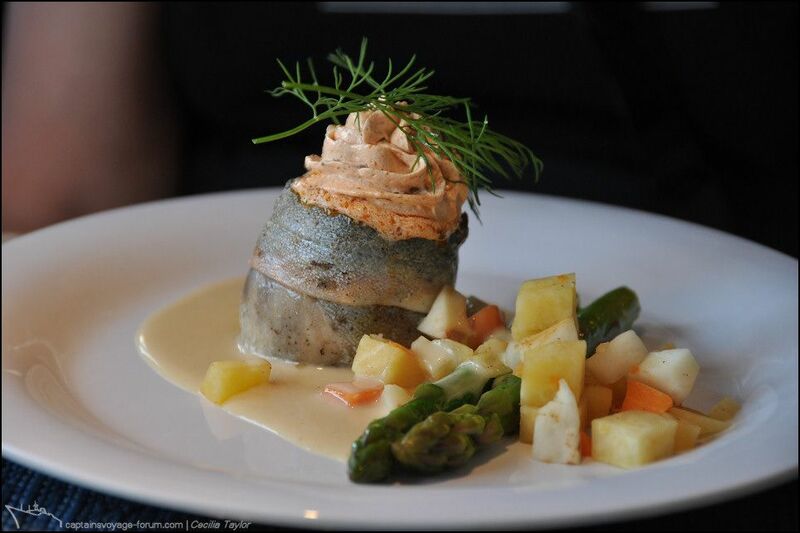 That white wine would go very nicely with this main course! 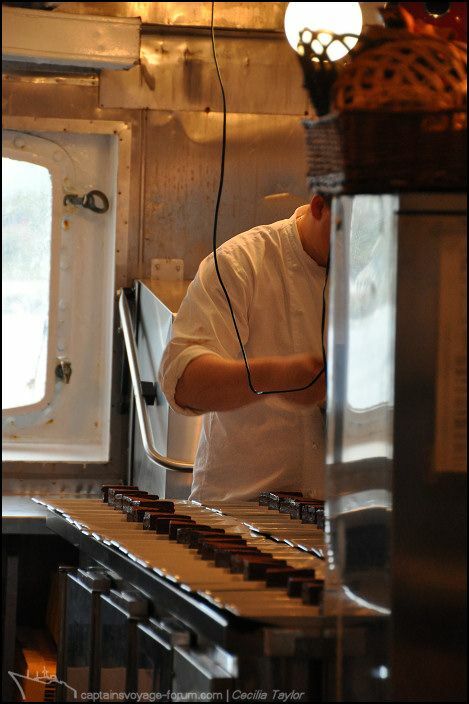 On one of my perambulations around the ship I got this glimpse into the galley where the dessert was being plated. 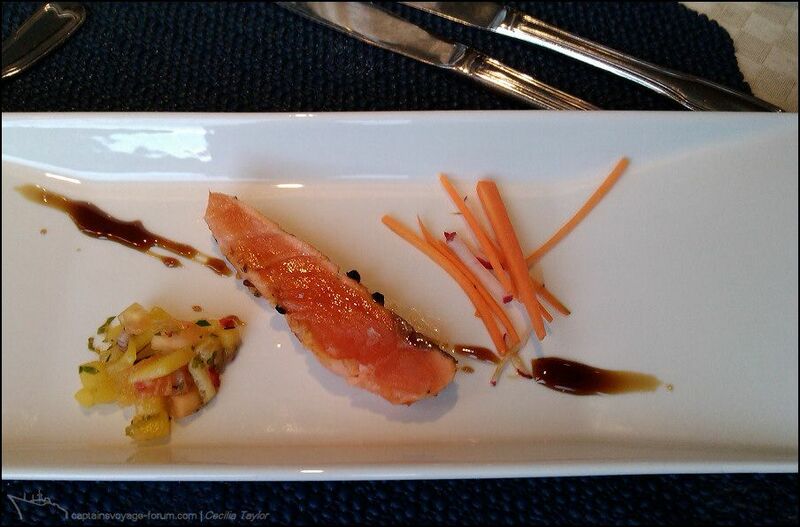 Sorry I don’t seem to have remembered to photograph the completed dish at dinner. Mmmmm, chocolatey!